Gurugram : The vision of Amity University Gurugram is to be a world class centre of creativity and innovation to contribute to the progress of humanity though excellence in education, industry and society relevant research and extension services. Creativity is an art of turning new and imaginative ideas into reality. Creativity is characterized by the ability to perceive the world in new ways, to find hidden patterns, to make connections between seemly unrelated phenomena, and to generate solutions. With the aim of fostering innovative thinking, technology incubation and to give a boost to start up entrepreneurial ventures, Amity University Gurugram has been in the forefront in promoting innovative thinking amongst our student body. 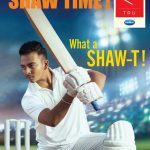 Each year “Day of Innovation” is celebrated with great enthusiasm to inculcate the spirit of innovation in our students. While addressing the students, Chancellor of Amity University Gurugram Dr Aseem Chauhan appreciated the student’s poster presentation & projects and also motivated them to work in the field of creativity and innovation. 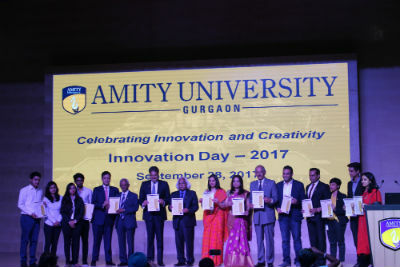 While motivating the students in his speech on ‘Innovation Infinite For Accelerating Entrepreneurship and Start Ups’, the Vice Chancellor of Amity University Gurugram Prof. (Dr.) P B Sharma said “Ask yourself what inventions mean to you, be part of the revolution in innovation to propel our country to project, on the strength of source and technology to eradicate poverty and drastically improve the quality of life of our nation”. Students from Amity University Gurugram, Amity University Uttar Pradesh, Amity University Lucknow, Amity University Gwalior, Amity University Rajasthan displayed their innovations in the fields of science and technology, fashion designs, art and entrepreneurial ideas in the campus. A plethora of 15 working models (i.e. Bio Gas Plant, Sukun Shiro Dhara Model, Water Purification System for Community Usage etc) and 48 poster presentations exhibited by students to show case their spirit of innovation were displayed. The guiding vision of our country’s’ innovative entrepreneurship is to accelerate the pace of discovery and delivery of Science led solutions for faster, sustainable and inclusive growth. Dr Ashok K Chauhan, Founder President, Amity Group inaugurated BIONNOVA Research Labs in university campus. Dr. Ashok K Chauhan, Hon’ble Founder President, Amity Group; Dr. Aseem Chauhan, Hon’ble Chancellor, Amity University Gurugram; Ms Divya Chauhan; Dr. PB Sharma, Vice Chancellor, Amity University Gurugram; Maj Gen (Retd) BS Suhag, Dy Vice Chancellor, Prof Padmakali Banerjee, Pro Vice Chancellor, Maj Gen G S Bal (Retd), Dr Rajendra Prasad, Dr. W Selvamurthy, President, ASTIF, Dr A K Yadav, Dr Vikas Madhukar, Maj Gen P K Sharma (Retd), Rajiv Mishra faculty staff and students were present at the innovation day.